"It's not beef and broccoli without rice. Begin with Uncle Ben's® Whole Grain Brown Rice, then add minced garlic, soy sauce, and stir-fry things up for an unforgettable dish." In a large skillet, spray with non-stick spray and saute the beef until browned. Add the garlic, green onion, broccoli and soy sauce; saute for 1 minute. Add the rice and water (according to package directions), bring to a simmer, cover and cook for 10 minutes. The perfect one-skillet weeknight dinner solution. Not recommended....not a lot of flavor. I've gotten alot of great recipes of this site...this is NOT one of them. We took a few bites. My family LOVED this dish!! No, it doesn't have a LOT of flavor, but I think that is what my children liked about it. It was mild enough tasting for everyone in my family to enjoy. My finace and I were looking for something simple and different. We loved it because it was healthy and easy! I took the rest for lunch the next day!!!! I added Black Bean Garlic Sauce, sugar snap peas & sweet onion in place of the green onion. Used leftover rice & beef roast. 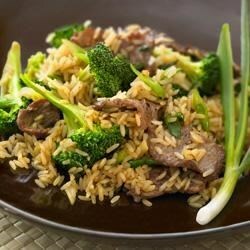 Sautéed the veggies then added the rice & beef....very good & easy! It was yummy!! I added onions and garlic with the beef and used olive oil. I also threw in some mushrooms with the broccoli. It was a hit with the family!